Prof. Dr. Norbert W Paul is the Director of the Department of History, Philosophy and Ethics in Medicine, at the Johannes Gutenberg Medical University, Mainz, Germany. Dr. Paul is the founder editor of Medicine Studies (Springer Link), created and conceived as a platform for interdisciplinary scientific inquiry, at “the intersection of medicine, science and society beyond disciplinary boundaries”. Dr. Gordijn is the Director, Institute for Ethics at the Dublin City University, Dublin, Ireland. In 1995 he was awarded a doctorate in Philosophy from the Albert Ludwigs University Freiburg, followed by a doctorate in Bioethics from the Radboud University Nijmegen in 2003. Bert is Editor-in-Chief of two book series: "The International Library of Ethics, Law and Technology" and "Advances in Global Bioethics" as well as a peer reviewed journal: "Medicine, Health Care and Philosophy", all published by Springer. He is an eminent bioethicist based and working out of Mumbai, India. Dr. Jesani is the founder of the Indian Journal of Medical Ethics (www.issuesinmedicalethics.org) and currently its editor. He is also a Trustee of Anusandhan Trust (www.anusandhan.org) - a trust dedicated to empowering disadvantaged peoples and providing technical assistance to organizations doing research and advocacy. He is a Researcher, Bioethics and Global Health Pune and Adjunct Professor in the Centre for Ethics, Yenepoya University, Mangalore. Anant has done his Master's (MHSc) in Bioethics from the Joint Centre for Bioethics, University of Toronto, Canada in 2005. He is President of the International Association of Bioethics. Dr. Lavina Noronha is the Director, Ave Maria Palliative Care Centre, Vamanjoor, Mangaluru. She has completed her PhD in Social Work from University of Illinois at Urbana-Champaign, USA in 2000. She has vast clinical, research and academic experience in the area of counseling, death and dying and palliative care. ​ She is the recipient of the Hearst Research Grant for several years and has done work on cross-cultural death rituals, death anxiety and attitude towards death, in collaboration with Dr. Brenda Guerrero. 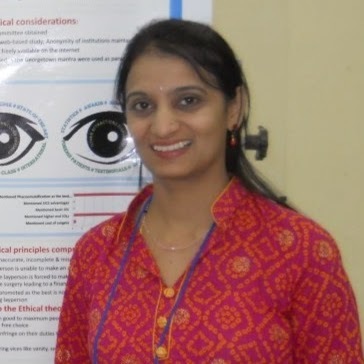 Dr. Uma Kulkarni is Professor, Department of Ophthalmology, Yenepoya Medical College and part time faculty at the Centre. She is trained in bioethics, medical ethics and clinical ethics. Her areas of interest include neuro-ophthalmology, vulnerability in human subject research and empathy in clinical care. Besides teaching at the Centre she is Course Coordinator for the Postgraduate Diploma in Bioethics & Medical Ethics. Dr. Abhay Nirgude is Professor & Head, Department of Community Medicine, Yenepoya Medical College, and a FAIMER Regional Fellow. He is Deputy Director, Centre for Health Professions Education at Yenepoya deemed to be University. He has completed his Postgraduate Diploma in Bioethics & Medical Ethics in 2014. His interest areas include community engagement in biomedical research and developing curriculum in medical ethics. Dr. Leena works full time as Assistant Professor & Museum Curator in the Department of Forensic Medicine & Toxicology. She has training in museum techniques and also holds a postgraduate diploma in bioethics and a postgraduate diploma in forensic anthropology. She completed her PhD in the role of museums in medical education from Yenepoya deemed to be University, Mangaluru. In addition, she is the coordinator of the Postgraduate Diploma in Forensic Anthropology conducted by the Department of Forensic Medicine. Dr. Grrishma is an Assistant Professor in the Department of Phyisology, Yenepoya Medical College. She completed her Postgraduate Diploma in Bioethics and Medical Ethics in 2017. Her research project was on ethical issues in the use of artificial intelligence in health care.